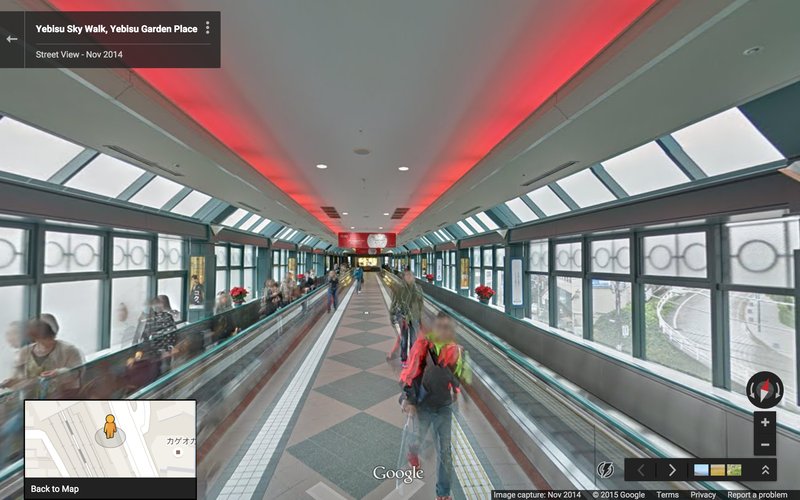 Have you ever wondered why moving sidewalks are confined to airports? 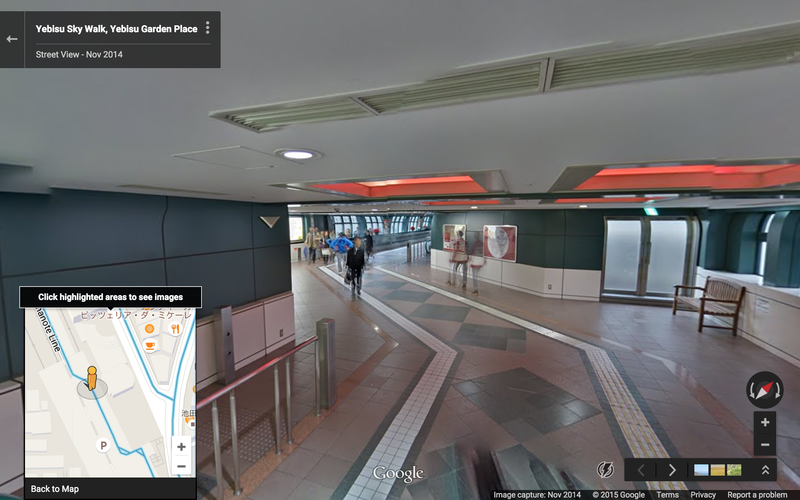 Why aren’t there any moving sidewalks leading to the train station? 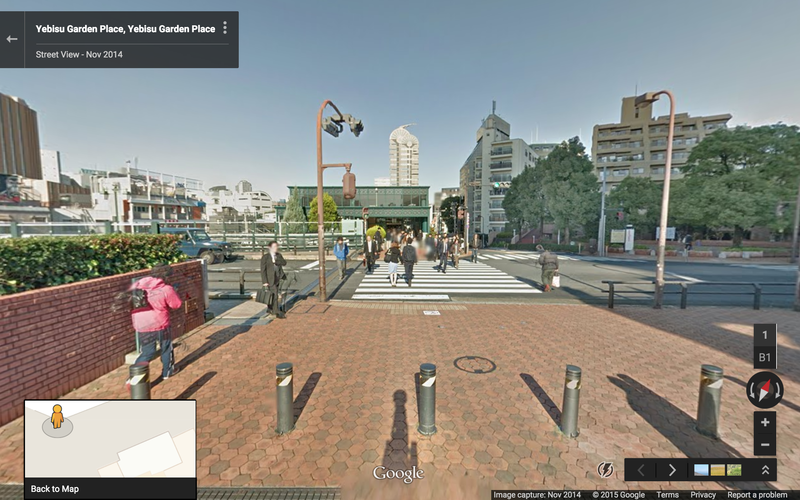 This tour starts in spectacular Ebisu Garden Place, spins around a bit to take in the view, and then proceeds north along the Ebisu Skywalk to Ebisu Station (JR Yamanote). 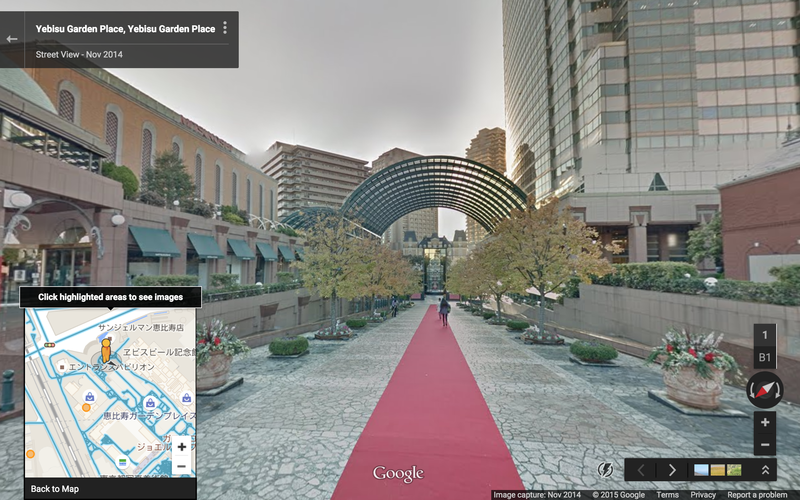 Ebisu Garden Place: Hill Road Promenade and Center Plaza – looking south (technically south-east). 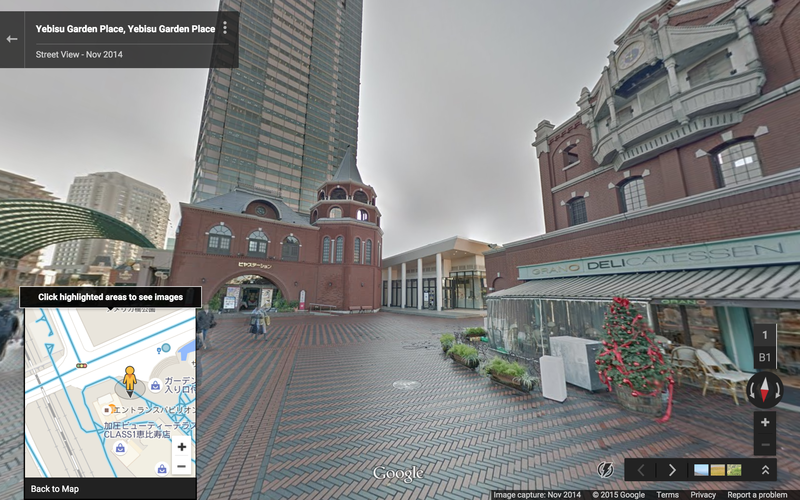 Note that Center Plaza (the area under the glass roof) is itself at basement level. Entrance Pavilion – north side. 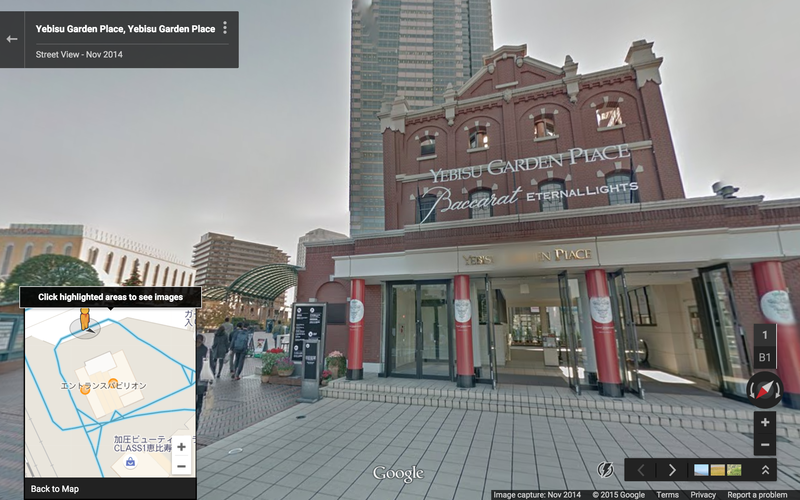 Ebisu Garden Place – straight ahead is Sapporo Beer Station, and to the right is Entrance Pavilion. Entrance Pavillion – south side (looking north). 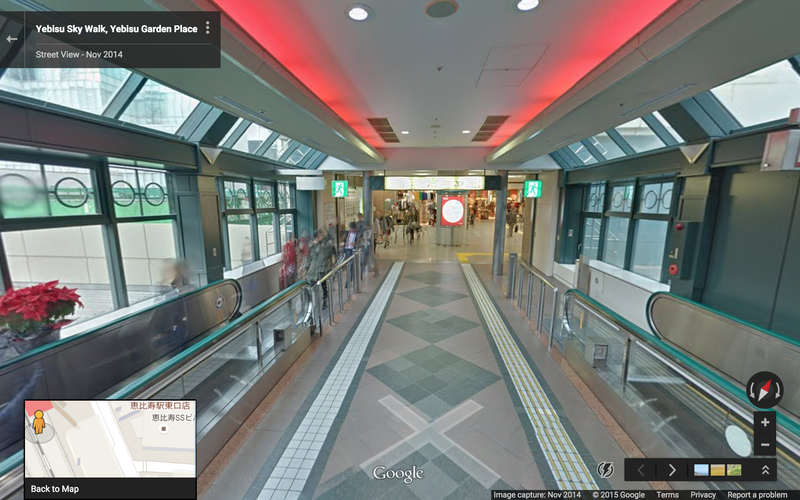 Notice the escalators. Bottom of escalators – looking east. 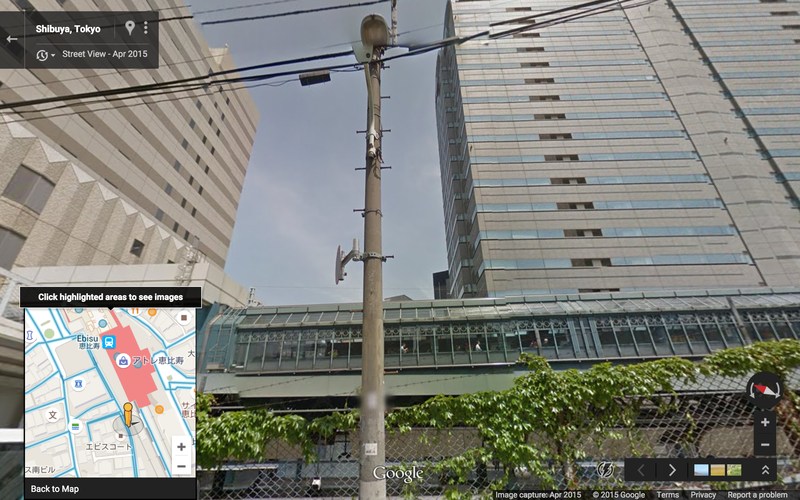 If we go straight ahead and turn right, we can reach Center Plaza, passing Mitsukoshi and Bugatti on the way. 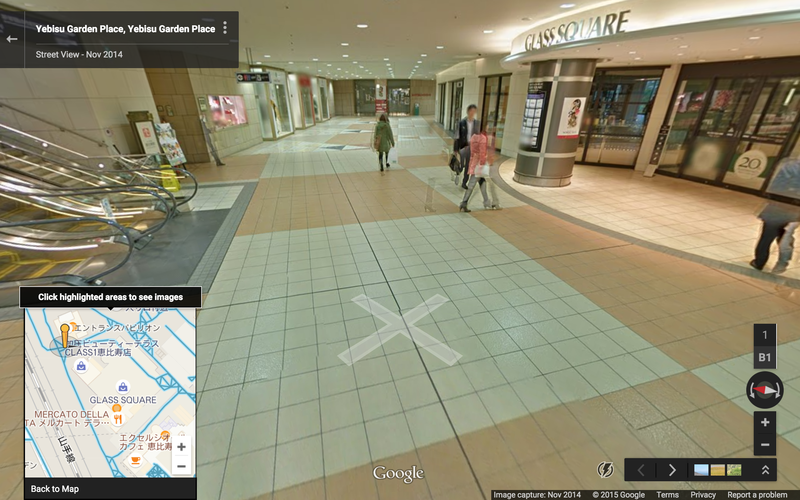 The tunnel mall continues on past Center Plaza, all the way to The Westin Tokyo. 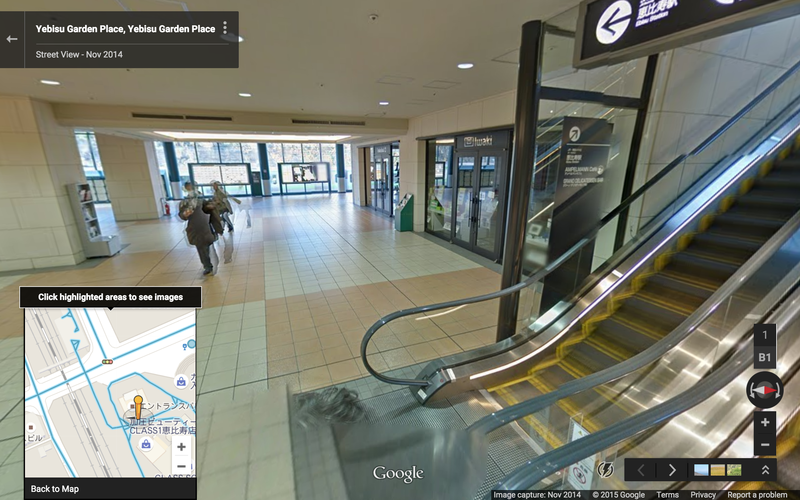 Bottom of escalators – looking west. JR Yamanote tracks straight ahead out the window. 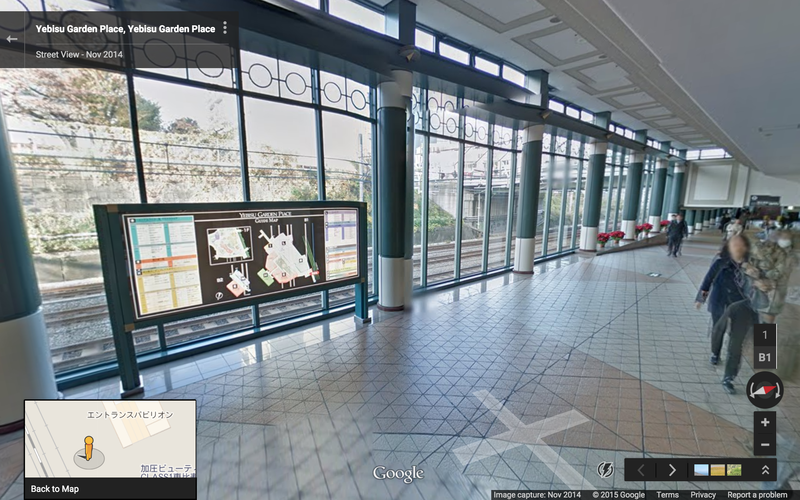 This corridor leads north, parallel to the tracks. 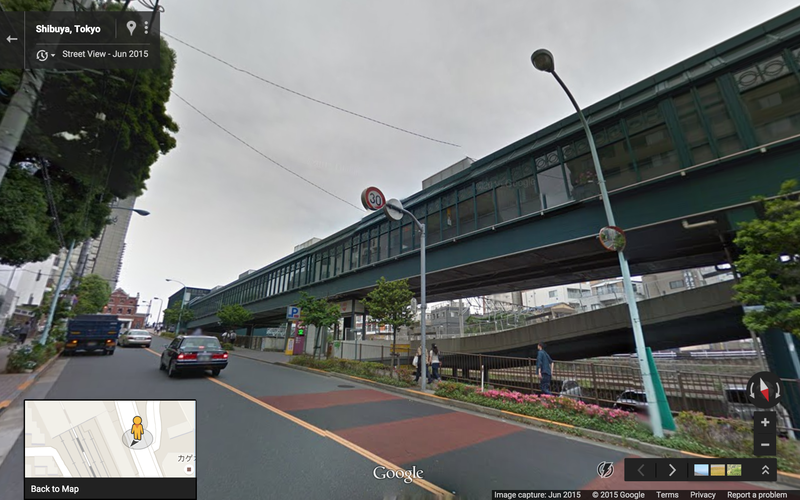 If we follow this corridor, we will cross under the avenue on the north side of the Garden Place complex, and arrive at the south end of the Ebisu Skywalk. Looking north. 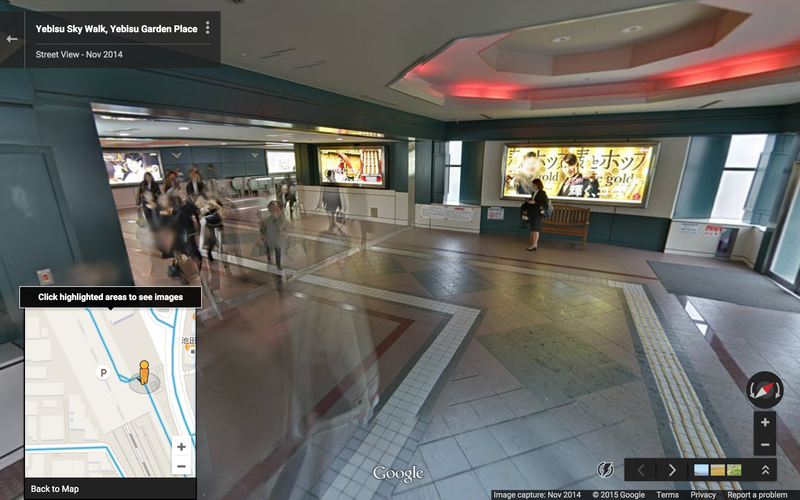 The south entrance to Ebisu Skywalk is straight ahead. 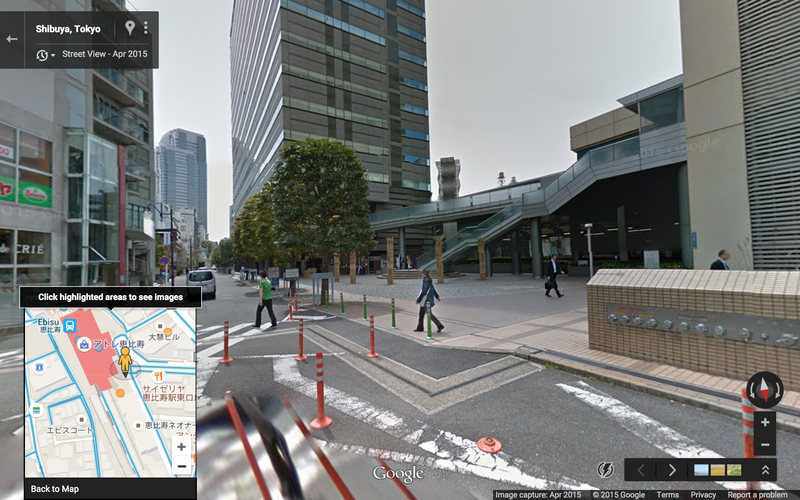 The boxy green structure across the street is the entrance to Ebisu Skywalk. 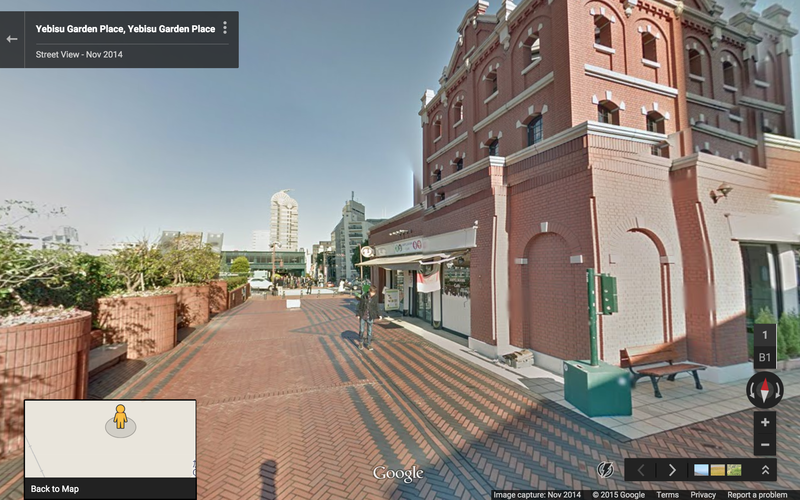 Note the railings between street and sidewalk. 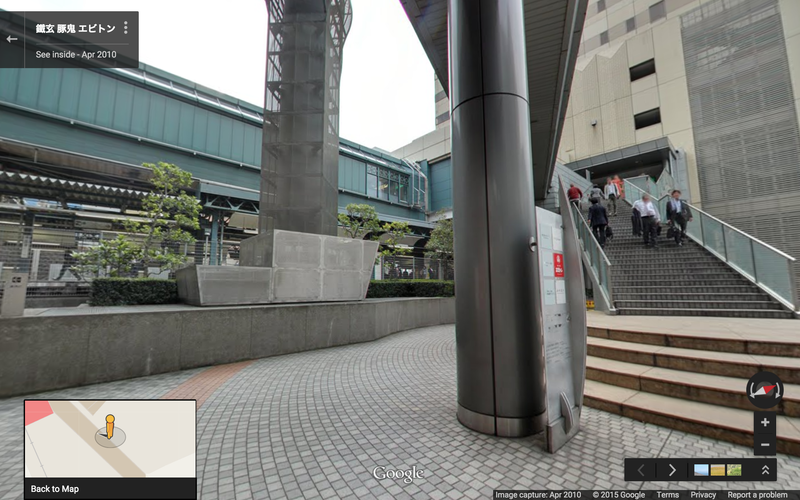 The south entrance to Ebisu Skywalk. South end of parking ramp. Note the reduced ceiling height and absence of windows inside the parking ramp. North end of parking ramp. 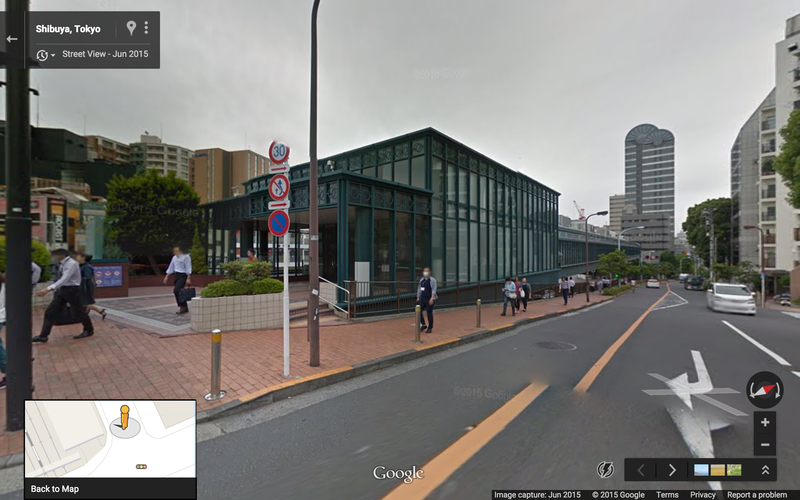 JR Ebisu Station, south-east entrance (the closest entrance to the north end of Ebisu Skywalk. 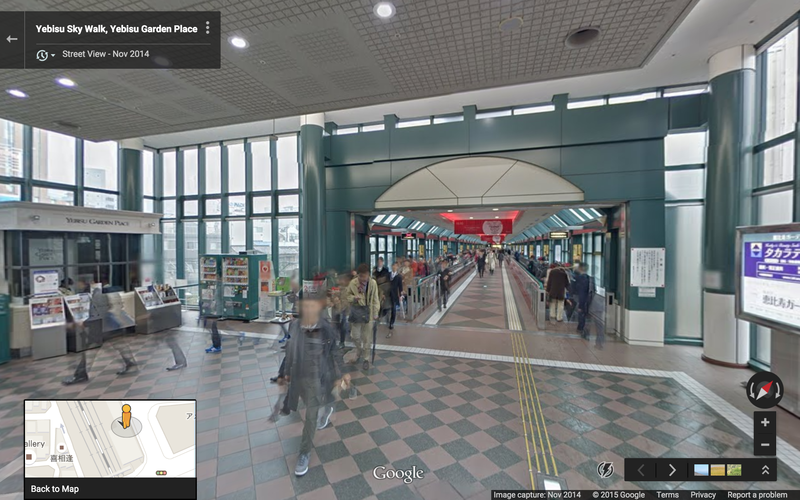 Another view of the south-east entrance – Skywalk on left. 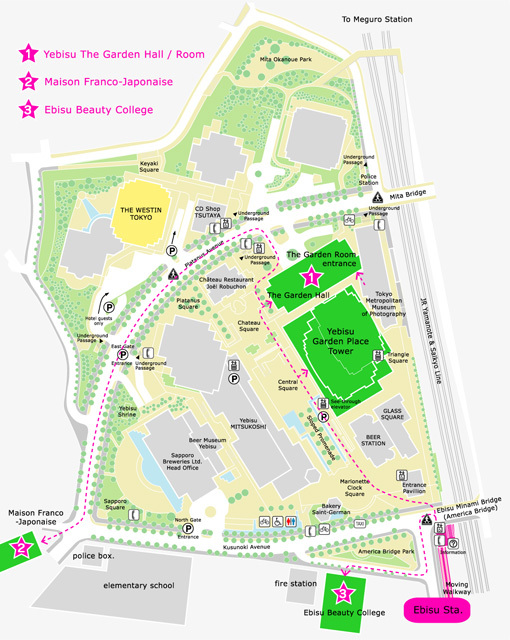 Ebisu Area Map. 500 foot scale. 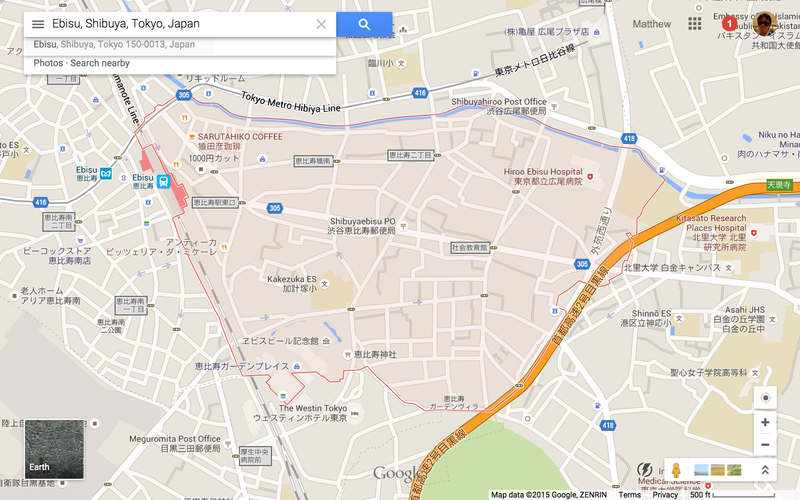 Note that Ebisu Station on the Hibiya line, as well as parts of the Ebisu Garden Place complex (e.g. 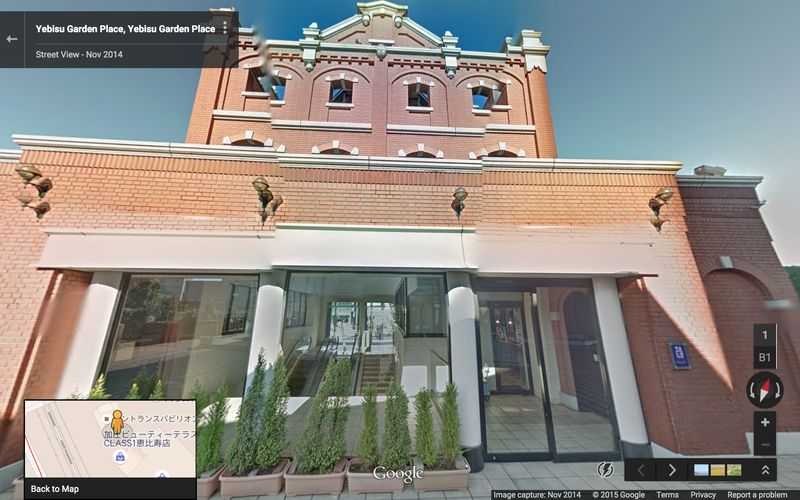 the Garden Hall & The Westin Tokyo) are technically located in Meguro, not Ebisu. Satellite view of the same area. 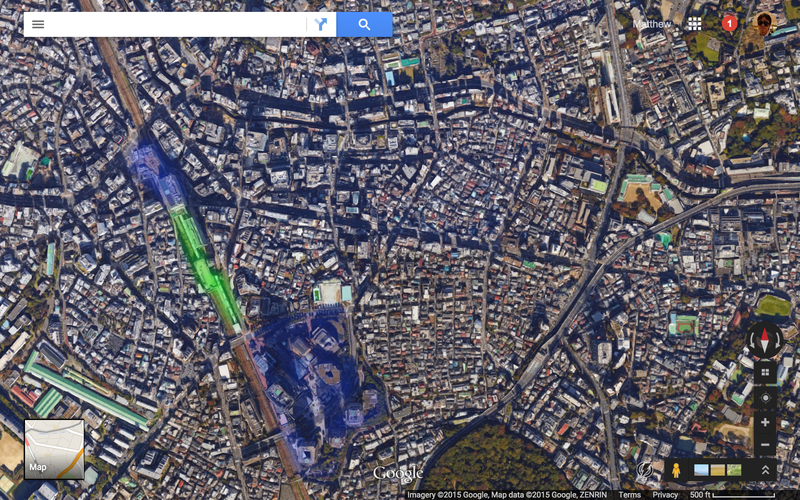 Ebisu Skywalk highlighted in green, JR Ebisu Station and Ebisu Garden Place complex highlighted in blue.